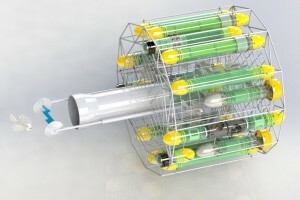 A 3D rendering of a lionfish harvester robot being developed by robots in service of the environment (RISE). MASSACHUSETTS – There’s boundless potential for robotic technology to address environmental catastrophes. So, eecognizing that, chairman, CEO and founder of iRobot Colin Angle and CEO of Science From Scientists Erika Angle have founded Robots in Service of the Environment (RISE), an independent non-profit organization focused on developing robots to solve environmental problems. The non-profit’s first initiative is to develop an undersea robot to slow the destruction caused by lionfish, an invasive species drastically reducing biodiversity and coral reef health in all warm waters of the western Atlantic. Since their accidental introduction over 25 years ago, lionfish have relentlessly invaded the western Atlantic, devouring over 100 different species of reef fish and crustaceans around Florida, throughout the Caribbean. An indiscriminate and voracious predator, one lionfish can reduce the fish biomass on a reef by 80 percent in just one month. It is now considered by marine biologists as a top threat to the Atlantic marine ecosystem along with climate change and ocean acidification. On April 19, at the 11th Hour Racing #EatLionfish Chefs’ Throwdown at the National Museum of Bermuda, RISE will unveil a functional prototype of an affordable robot that will enable the mass capture of lionfish below depths reachable by sport divers, where the population expands unchecked. At the same time, it will launch a crowdfunding campaign to support the final development of the robot as well as resources to bring it to market in scale. “Built by a team of volunteers made up of skilled roboticists, scientists and business people, all passionate about the environment, rapid progress has been made on the first prototypes of a robotic solution to one of the top threats to the Atlantic marine ecosystem,” said John Rizzi, Executive Director of RISE.